Shadowmere is Astrid's personal horse, received during The Cure for Madness, a Dark Brotherhood quest. Shadowmere has more health than any of the other horses in Skyrim and regenerates health extremely quickly. His introduction is rife with macabre undertones: rising up from the bubbling dark waters and black smoke. His appearance also has a strong Dark Brotherhood theme, with glowing red eyes and black hand-prints on his saddle blanket. Astrid claims that the horse is "one of us." Shadowmere is not essential and can die, unlike his counterpart in Oblivion. However, 10 days later, he will respawn at the location of his death. If Shadowmere dies in a river or lake, he will respawn after 10 days in the black pool near the Dark Brotherhood Sanctuary. The Cure for Madness: Confront the traitor among the Dark Brotherhood. When summoned, the spirit of Lucien Lachance will sometimes greet Shadowmere as "Shadowmere, my old and dear friend." Because of his high health (1637) and his ability to rapidly regenerate health (82 hp/s normal, 368 hp/s in riderless combat)[verification needed — see talk page], Shadowmere can defeat low to mid-level enemies despite his low damage output (10 per attack). However this low damage output makes him vulnerable in prolonged combat with enemies that have extreme damage dealing capabilities such as Ancient Dragons. Falling from a great height will also kill him. Though Shadowmere is implied to be the same horse in both games, it is referred to as a female in Oblivion and as a male in Skyrim. Shadowmere's health was initially 887, but this was silently raised by 750 points in patch 1.8. When completing the subquest to gain Shadowmere, having a purchased horse with you can cause Shadowmere not to appear. Shadowmere can be debugged after this happens by fast traveling to the stable of origin of the last owned horse. Shadowmere will appear here for a second and then vanish, and reappears permanently when you fast-travel back to the Dark Brotherhood Sanctuary. If you completed Stabilized in favor of Shadr, Shadowmere will first appear at the Riften stables. If you have Frost, the horse from the quest Promises to Keep, Shadowmere may not appear and fast traveling back to Black-Briar Lodge stables or Riften stables has no effect. Shadowmere will respawn by the sanctuary pool on your return from Solitude at the end of To Kill an Empire. 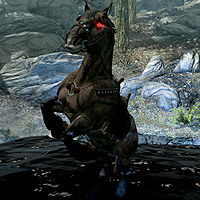 Use the console commands prid 9ccd8 and moveto player to bring Shadowmere to your location. If this doesn't work, use player.placeatme 0009ccd7 to create a new Shadowmere at your location. After summoning the Spectral Assassin, Shadowmere may disappear or refuse to follow you. Shadowmere may not respawn after dying. After summoning Arvak, Shadowmere may no longer follow you. 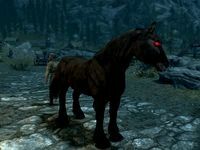 Most often, Shadowmere can be found outside Castle Volkihar. However, Shadowmere may not be present there. This can sometimes be fixed by purchasing another horse, then going to the Falkreath Dark Brotherhood Sanctuary, where Shadowmere will appear from the pond. This page was last modified on 14 October 2018, at 23:35.